The Blue Ribbon Commission On America's Nuclear Future (BRC) issued its final draft report today and recommended that at least one new site should be found to store waste left over from the nation’s nuclear power plants. 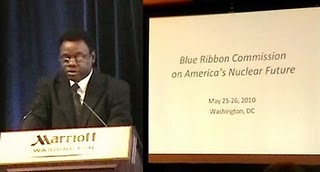 The blue-ribbon commission assigned by President Obama in January 2010 to come up with an alternative to the plan for a nuclear waste repository at Nevada’s Yucca Mountain, also adopted a Center recommendation: the creation of a new federal corporation to manage the site rather than turning it over to the U.S. Department of Energy. NFRC Cochairman Norris McDonald testified before the commission and recommended the creation of a Nuclear Waste Management Agency (NWMA). The BRC adopted this recommendation. Mountain. The commission — chaired by former Democratic congressman Lee Hamilton and Brent Scowcroft, national security adviser to President George H.W. Bush — does not suggest where that storage site would be located. This is a cop out. NFRC disagrees with President Obama's decision to abandon Yucca Mountain as America's national repository for nuclear waste. The report recommends guidelines for a selection process — such as giving local communities, but not states, the power to veto a facility. Many members of the commission believe that New Mexico, which already has a nuclear waste storage facility, might prove more receptive than Nevada to a federal waste site. The group also recommends finding an interim storage site for waste that is now being stored at 10 closed reactors at nine different sites. All but one of the sites have the used nuclear fuel in dry casks, and the commission said there would be fewer security risks if the waste were stored in one place. NFRC does not support this recommendation because we believe Yucca Mountain is the best location for the national nuclear waste repository. For years, electric utilities with nuclear power plants paid about $23 billion in fees to the federal government to finance the repository, and substantial preparation was done at the Yucca Mountain,Nevada site. Some of those utilities have filed lawsuits to recover the money.